GDS Packer, GDS Mailman. Application mode for this Karnataka GDS Jobs is Online. Last date for online application submission @indiapost.in/gdsonline is 10-06-2017. This is such a great opportunity for youngsters who qualified 10th class and looking for Jobs in Central Government. Candidates should also know the Computer usage knowledge. Selection for this Kerala Gramin Dak Sevak Jobs will be based on Merit in 10th class marks. 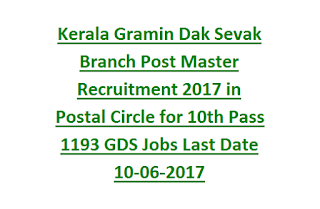 Written test and interview will not be conducted for this Kerala Gramin Dak Sevak Jobs Recruitment in Postal Department. GDS Jobs Recruitment in Kerala State complete information is mentioned below. 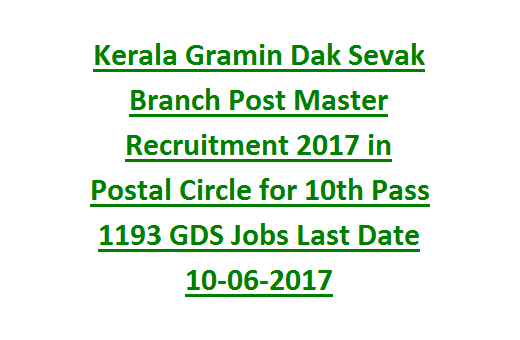 Total 1193 Gramin Dak Sevak vacancies Postal Department of Kerala State. Maximum age limit for General candidates as on 10-June-2017 40 years and minimum age limit is 18 years. For OBC candidates Upper age limit is 43 years, For SC/ST candidates Maximum age limit is 45 years and for PH candidates upper age limit is 50 years for this Kerala Gramin Dak Sevak GDS Jobs Recrutiment 2017. Post wise Salary details of Gramin Dak Sevak is given below. Rs.100 for UR and OBC candidates. Using system generated registered number pay the application fee in E Post Offices..
For Kerala GDS jobs candidates selection will be based on marks in 10th class. If you are having any other higher qualifications it will not be considered for preparing a merit list. Merit list will automatically generated by system based on candidates marks entered at the time of online application. Based on this merit list candidates will be called for certificates verification. Intimation will be give through SMS or mail only. Candidates who has the above said qualifications for this Karnataka Gramin Dak Sevak Recrutiment 2017, they can apply online through official website of GDS jobs recruitment is www.appost.in/gdsonline. At first Candidate has to register online then registration number will be generated. Pay the fee using registration number and then upload the all required documents and then submit application form. Closing date for online application form for this Kerala Gramin Dak Sevak jobs is 10-06-2017.